Terry Derkach is a songwriter, producer, mixer and the co-founder of Hookist, a month-long songwriting event where established songwriters, music legends and rising stars collaborate with die-hard fans and musicians to build an original song together, line-by-line. With a music career spanning more than 20 years, Terry started playing guitar and writing songs as a teenager. He officially got into the music business as an intern at Media Sound studios in New York City, where he fine-tuned his craft working with legendary producers and mixers including Bob Clearmountain, Kevin Killen and Michael Brauer at the same time as he was an in-demand studio musician, songwriter and sideman. In 2006, he opened his own recording and production facility, VRTCL Entertainment. Terry has written, produced and played with multi-platinum artists: Brad Roberts (Crash Test Dummies); gospel vocalist Vernon Bush (Whitney Houston, Nancy Wilson, Ray Charles); and a host of others. 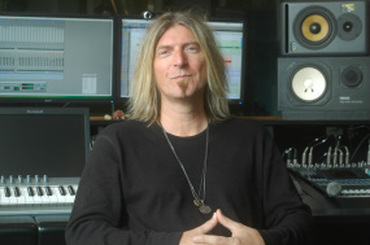 He most recently completed mixes for Manitou – a new project led by former Scissor Sisters drummer; Patrick “Paddy Boom” Seacor with an all star lineup featuring members of David Bowie; Brand New Heavies and David Byrne. Latest film projects include Kill Your Darlings (ADR), Love Locks (composer/mix), La Redempcio dels Peixos (mix), Tsuzuku (sound design/mix) and Sharbat (scoring/mix). His other celebrity clients include Donald Trump, Russell Simmons, Peter Guber, Tony Robbins, George Foreman and Barry Levinson. Hookist launched on July 7. I talked to Terry about his experience on both sides of the glass and how he has successfully carved out a niche for himself in the industry. He also explained the philosophy behind Hookist and how it will help both established and emerging artists get their music out there. Thanks so much for taking some time to talk to me, Terry. How did you get started in the music business? My father played guitar, and he and my mom both sang at parties. They’d wake me up at 10 or 11 at night, and we’d go to a party at one of their friends’ houses. They would pull out their guitars and sing country songs – all those country tunes by Johnny Cash, Merle Haggard, etc. I showed interest in playing guitar – particularly rock music – so they got me an electric guitar. I started taking guitar lessons in the late 60s/early 70s, when I was about 10, but I initially felt it wasn’t for me at all. Looking back, I think it was just that the instructor wasn’t right for me. I just didn’t feel any incentive to learn how to play the songs he was suggesting, so I told my dad I didn’t want to take lessons anymore. After that, I would sit in my room with my record player figuring out on my own how to play along to 45s and albums by the Beatles, Hendrix, The Stones, etc. I kept playing, jamming with friends and learning songs throughout my teens. It wasn’t until I moved to New York and landed an internship at a studio called Media Sound that I officially got into the industry. I had the opportunity to work under some amazing mixers and engineers like Bob Clearmountain and Michael Brauer. That was an incredible experience. Not only did I get to learn the technical aspects of recording and all the equipment, but I also got to see legends like Jeff Beck, Keith Richards and others come in and record. Simultaneously, I got to experience the conversations that were happening in the studio – how engineers talked to artists, labels, management and agents. I got to be a fly on the wall and learn how conversations like that happen. While I was there, I got to work with The Talking Heads, Aretha Franklin and others. When I was at Media Sound, I also started playing guitar again. A friend turned me onto pick-up gigs at places like Kenny’s Castaways, The Bitter End and CBGBs. That gave me experience as a sideman/instrumentalist, which was really what I had come to New York for initially. I was constantly putting myself out there, working with as many people as I could in as many different genres as possible. I eventually started working more with singer/songwriters. Because I am more of a songwriter than a singer, I’m pretty quick to learn songs; I can often learn the basic changes to a song before it’s actually finished. People who aren’t necessarily great players – even though they are capable of playing guitar while they sing live – still come to me to play guitar on their recordings, and they were coming to me a lot back then too. I moved into a place in the middle of Hell’s Kitchen that was at one time Jeff Buckley’s studio. And that’s also the same place where my friends in Sharon Jones and the Dap-Kings started out. It was definitely a cool spot for what I was first doing. Then, as I got a little busier, and my clients became more diverse genre wise and started to have more complex needs, I realized I was going to have to change my location and business model. Also, owning a recording studio isn’t really necessarily a great way to make money. I knew I needed to focus more on what I was putting out – recording and producing as many talented up-and-coming artists as I could and get their music out there so I could get my name out there as a producer, mixer and instrumentalist. I’ve been in my current studio in the Flatiron area of New York City for about five years now. It’s a great spot. I no longer sit in a dark cave for 10 or 12 hours. I have windows that beam sun all day long into my control room. It has completely changed the vibe. Working in a dungeon is a tough thing. And you’ve been making your living in music now for about 15 years, in a city where it can be really tough to survive as a musician. What do you think you’ve done that other musicians and studio owners who have fallen by the wayside haven’t? Just to clarify, while I have had my own studio for about 15 years, for the first five years, I was also working for a company producing live events for them. I would go out of town for a few days, produce an event, then come back and work in the studio and as a musician. That was how I helped fund it in the early days. So, in those early days, my primary career was subsidized. To answer your question, I think what I have done differently is turned my studio into a one-stop shop. A lot more people are doing it these days than were doing it when I first started. Someone can come to me with music and no lyrics, lyrics and no music or even just a melody, and I will be able to help them write a song. Because of my engineering chops, I know how to record a multitude of instruments. I’ve worked on both sides of the glass and have worked with very high-end producers and engineers, so I am able to develop a solid rapport with artists, managers and clients of all kinds. I can give an artist a comfortable studio environment where they can be themselves and just go in and do their thing. I think that’s absolutely key to the creative process. My philosophy with artists I work with is, “Come in, and let me facilitate your creative process.” And I think that’s why I am able to build the trust needed to collaborate on songs. Of course, when you start collaborating with someone, there will sometimes be a few bumps in the road. But once the trust is built, in my experience, there are more hits than misses. How did you first come up with the idea for Hookist? Well, it’s a long story, but basically my partner, an actor, and I found ourselves giving advice to a company that was building online fan experiences. After a very fun start, we quickly realized our interests were very different and that they were focusing on pop culture and even tabloids and we were interested in building something that involves the creative process and that gives fans a meaningful experience. We all agreed to go our separate ways, but my partner and I kept fleshing out our concept. One night she asked me specifically about an artist I work with: Brad Roberts of the Crash Test Dummies. He and I are working on a record of ancient Sanskrit mantras together. He is a super interesting guy, tells great stories about his writing process, and is an amazing singer-songwriter. And a light bulb went on over both our heads. We sat there for the next three or four hours with a paper and pen, fleshing out what this could be. How we could give artists a more authentic and meaningful way to engage with their fans – as opposed to tweeting photos of their kittens? We had about 80 bullet points of what the site could potentially turn out to be and the more research we did, the more we realized that this type of site could be an amazing revenue stream for all these artists that are struggling to sell their music in the Digital Age. We decided to call it “Hookist” because the “hook” of a song is always what is the most memorable about it, and a Hookist the person that writes these hooks. Hookist is a songwriting event that takes place over the course of a month. Each collaboration is run by an acclaimed artist/songwriter and geared towards his/her fan base as well as music lovers and songwriters, aspiring and otherwise. It’s a lyric-based community songwriting event. Every day, the community that has signed up to play Hookist submits individual lines of lyrics. Then the community votes on which lyrics are the best. The top-rated lyrics get pushed to the top of the voter board for the artist to see. The artist may choose lyrics from the top of that board or decide he/she doesn’t like them and scroll down further. The artist picks lyrics that work based on his/her initial idea. The artist can use lines verbatim or change them slightly. The collaboration continues every day for a month. At the end of the month, when the song is written, the artist chooses a grand prize winner. I think the idea is so great is because it’s really an amazing new revenue stream for artists. And it’s a way for them to engage in real, interactive ways with their fans. When you sign up for Hookist, you receive a profile page, where you can share personal music projects, ask for feedback and build your own fan bases. You can also promote yourself using the kudos you receive from the artists and the community. That means that if you are an aspiring artist, you can put up your songs, YouTube links, SoundCloud, merch, touring, etc. It becomes your own promotional page. What this also means is that if you are an aspiring songwriter that is part of the community and have your own page up, writing a song with Brad or any of the other established artists we will have participate in the future, you are getting an incredible opportunity. You’re getting the chance to potentially have these established artists and other members of the Hookist community look at your work, in turn, increasing your exposure exponentially, which is something all new and emerging artists are looking for. So, the site Hook(ist) is mutually beneficial to both the established artists leading the collaborations and the aspiring artists participating. Plus, I think it’s going to be a lot of fun to see what people come up with! Members also receive Road Stories, an industry insider/thought leader blog, where Grammy winners, top session players, engineers and techs share personal stories from the road and studio, and offer advice on navigating the music industry. Hook(ist) will also use the platform to raise money and awareness for partner charitable organizations like Musicians on Call, which brings the healing power of music to hospital patients across the country, and Salute Military Golf Association, which uses rehabilitative golf experiences to empower seriously injured war veterans. Hookist is up and running as of July 7. You can learn more about the work Terry Derkach is doing with artists on the VRTCL Entertainment website or follow him on Twitter.